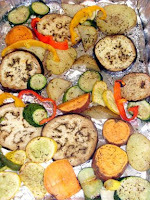 Several months ago, I found a recipe for Roasted Vegetables on AllRecipes.com (my favorite recipe site). Out of 610 reviews, it has a 4-1/2 star rating. I knew it had to be good. Me being a detail-head, I read most of the reviews and decided I would have to make this. Then I promptly forgot about it. Once I joined Weight Watchers, I went to their site and checked out a few of their recipes. Vegetables have a zero point value so naturally, I wanted to check out all the vegetable recipes. The one that stood out to me was their recipe for Roasted Vegetables. Their recipe called for some or all of the vegetables you see pictured above. The only difference between their recipe and the one listed on AllRecipes.com was that Weight Watchers instructed to cut all the veggies into similar-sized pieces, place them in a single layer on a foil-lined cookie sheet (I used two), spray with no-fat, no-calorie cooking spray, and finally sprinkle with salt, pepper, thyme, and any other seasoning you prefer. Place them in a 450 degree preheated oven and let cook for 25-30 minutes. If you choose eggplant, squash, or zucchini, keep in mind that they cook faster than the other veggies so you might want to remove them sooner. I let everything stay in the oven for the entire 30 minutes and loved the results. Here's the shocker: My husband and teenage son loved them! My husband, Paul, loves salads but other than that, he's not a big veggie lover. Neither is my teenage son. Well, they kept going back for more until everything was gone. Everybody's favorite vegetable was sweet potatoes, which was a big surprise as well. 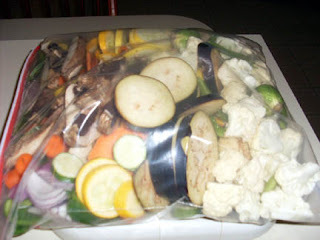 Once I chopped all the vegetables above, I put them in a 2-1/2 gallon ziploc bag and weighed them. They weighed 6-1/2 pounds! So we had enough veggies to make roasted vegetables for three days in a row! The following day, I tried the AllRecipes version and loved it - although, the entire family agreed that the Weight Watchers version was their favorite. Roasted vegetables has become my favorite zero point dish and we've decided to make them often. In fact, I'm about to go to the store to buy some for tonight! Last Thursday's Weight Watchers meeting was cancelled, due to our leader having to go out of town. So, I weighed myself at home Thursday morning and found that I lost 3 pounds! I hope you all had a wonderful weekend. It's 54 degrees and sunny here in central Arkansas. I love roasted vegetables - something about the roasting really enhances the flavors! Oh well, I still cook them that way for me once in awhile! Veggie rock! And good luck on your weight loss journey, you're off to a fantastic start! I do indeed love a good salad. And yes, I have to work on my love for vegetables. Often, I am forcing them down, simply because I know they are good for me. But these baked veggies are really good! 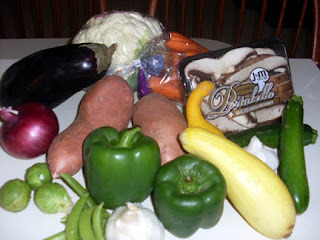 And I was pleasantly surprised, especially with the sweet potato, since that has never been my favorite. Keep up the good work, honey! I love you! I tend to eat the same ol' veggies over and over again, so I love trying new recipes on how to prepare them differently. Most of the time, I end up steaming them and adding different spices. Dawn - Boy, I love 'em too! If your hubby liked them as much as you do, you'd probably cook them more, huh? Big B - Thanks for the tip! Davida - Steamed veggies are great but I have to say I like them roasted best. Yum! omg, that sounds so yummy...and EASY! Veggies are my ALL TIME FAVORITE!!! I am totally craving them now thanks to your post! Love your blog! I love roasted veggies too. I always chop them into small pieces and then they caramalise which is lovely! I tend to use quite a bit of olive oil on them but if I am being extra careful I mix them with a little olive oil, soy sauce and fructose syrup for a lovely flavour! Yummy! I have done veggies like that before and you are right, they are fabulous! 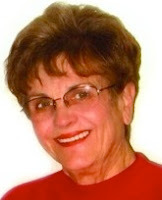 Come by and check out my blog. I have a two book contest going on right now. The book is "Never Say Diet" and the fitness book that goes with it. After checking out your blog, I think you may like it. I reveiwed it so I know it's great! Take care!